I have written in the past, many pieces which I have considered to be types of philosophical metaphor, through the form of poetry and short fiction - too many to mention. When considering this entry and draughting the basic ideas in my head, I bore this in mind. The study of the fundamental nature of knowledge, reality, and existence, especially when considered as an academic discipline? And what is a metaphor? A thing regarded as representative or symbolic of something else? And what is a KP? A person employed to wash dishes and carry out other menial duties in the kitchen of a restaurant or hotel? A good or bad KP holds one of the most essential roles in the kitchen. With no clean pans to cook the food in and no clean plates to put it upon, we could not even begin. The KP is the backbone of the kitchen. A modest opinion or estimate of one's own importance, rank, etc. I'm really not sure about that. Humility is not a trait that everyone in the kitchen naturally possesses. And that just might be a terrible shame. What if humility was actually the ability to put all thoughts of anyone else's opinion of you, out of your head. What if a dignified humility was the ability to say, I am in your charge, yet I am worth no less than you. Then I say that Nick and Flapper both have some humility. And both are quite simply, the very best of KPs. The problem is, that the only time that anyone recognizes a good KP, is when they are working with a bad one. I worked with Nick tonight. 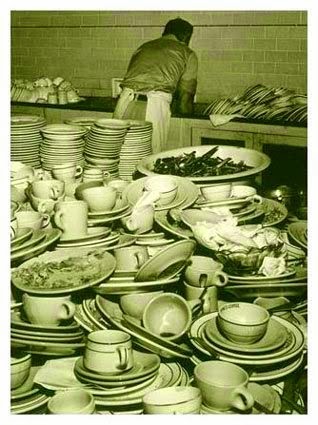 Tirelessly, he washes and stacks wave after wave of burnt-out pans, grime-caked trays, glued-out plates. Throwing out the dregs of unwashed tub after tub while throwing plates through the washer like a blink. Emptying bins, scrubbing floors, unblocking sinks, the list goes on and on, yet he finishes what I couldn't if I took four more hours to attempt it. But Nick is strong, fast and has stamina. He also has better things ahead of him, and perhaps too much energy for one person sometimes. His eye is sharp enough to betray a mad streak sometimes. He and Flapper make me welcome in the kitchen and I hope I have the same effect on them. In any case, I wish them both all the best that life has to offer, not just for the fact that they are both honest, hardworking men. All hail the KP unless you can do the job better than him. So what is a philosophical metaphor? Well, the KP is, of course. The KP represents the bottom layer of the kitchen pyramid. The foundation upon which the construction can be assembled. Undervalued, taken for granted, underpaid. I give you two hours.